A groundbreaking ceremony to mark the start of the $17.7 million renovation and expansion of the Biomedical Library at the University of California, San Diego, will be held at 10 a.m. July 20 on the School of Medicine grounds. Edward W. Holmes, vice chancellor of Health Sciences and dean of the School of Medicine, and Kenneth Olson, chairman of the University Librarian’s Advisory Board, will be guest speakers. David Miller, acting senior vice chancellor for Academic Affairs, and Brian E.C. Schottlaender, university librarian, will serve as co-hosts for the ceremony. A reception for community representatives will follow. 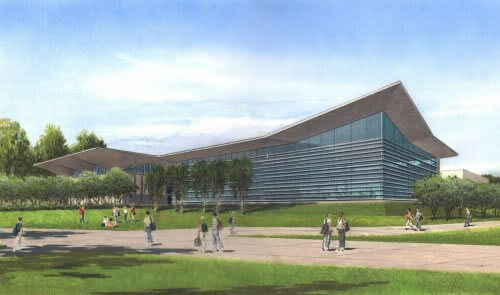 Actual construction of the 51,098 square-foot project is slated to begin in the fall, with completion of the renovation/expansion anticipated for mid-2006. During construction, the current Biomedical Library collection and services will move into temporary quarters in Geisel Library. The Biomedical Library’s collection will be housed in compact shelving in the west wing of the lower level, with the service desk, computers and current journals located nearby. Also scheduled for relocation during the construction period is the adjoining School of Medicine Administration Office. Some 40 staff members, including Vice Chancellor Holmes and his administrative team, will move into the recently completed UCSD Campus Multipurpose Building on Russell Lane at the end of August and remain there until work on the Biomedical Library is completed. The move is necessary because of the significant noise and facility disruption that will be generated by the library renovation project. The existing library, built in 1969 to serve 800 users, is 27,764 square feet. The expansion will nearly double the size of the library, adding 23,334 square feet, so that services to more than 4,000 students, faculty and visitors can be provided. Well designed space to house UCSD’s biomedical collections. Technology to support active use of biomedical information. A variety of environments that facilitate both quiet reflection and active group study. Enhanced access with both north and south entries. Flexible design that will support biomedical information needs for years to come. The present building has a unique and distinctive roof shape consisting of a series of poured concrete hyperbolic parabolas which were integrated into the new two-story structure by the architectural firm of Hardy Holzman Pfeiffer Associates. The general contractor for the project is McCarthy Building Companies. With more than 3 million volumes and 12,600 digital and electronic publications in their collections, UCSD Libraries comprise the largest research library system south of Los Angeles. In 2003, more than 2 million users—from scholars and students to business professionals and physicians—patronized one of UCSD’s 11 libraries to take advantage of their substantial resources.